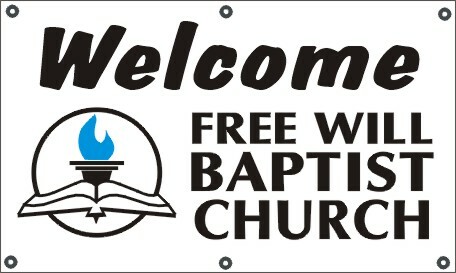 Our FREEWILL BAPTIST CHURCH Vehicle Signage is made with computer-cut vinyl lettering. A typical church van with two FREEWILL BAPTIST CHURCH LOGOS, CHURCH NAME AND A PHONE NUMBER typically cost about $150-$200. Call with measurements of vehicle and we'll send you a no-obligation proposal by fax or e-mail. FREEWILL BAPTIST CHURCH Vehicle Signage is made with the highest quality vinyl graphics ready to be applied to vehicle sides, doors and even windows. The graphics are squeegeed onto the surface and then the application tape is removed. The look is the most professional possible - and if you follow the instructions, you'll get perfect results. Click here to see APPLICATION INSTRUCTIONS. 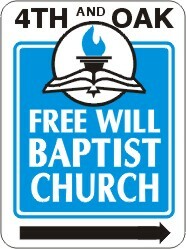 Our FREEWILL BAPTIST CHURCH Signage is made with computer-cut vinyl lettering. A typical church sign cost about $100-$150. Call with measurements of sign and specifications and we'll send you a no-obligation proposal by fax or e-mail. FREEWILL BAPTIST CHURCH Signage can be made with any size and message. This custom street directional sign is made of 18" x 24" white aluminum. They cost $40 each for .032" thick aluminum and $55 each for .080" thick aluminum. Our FREEWILL BAPTIST CHURCH Banners in larger quantities are printed using screen process printing sometimes called "silk screen." We use the highest quality exterior vinyl screen ink. For lower quantities, our Banners are made with computer-cut vinyl lettering. It looks the same as silk-screen, but is more economical in smaller quantities. Our banner fabric is vinyl reinforced with nylon with hems and grommets for the longest outdoor life. 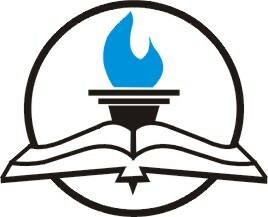 FREEWILL BAPTIST CHURCH Outdoor banners are made with reinforced vinyl banner material. They come with hems and grommets. They are rated for 2 years continuous exterior exposure. indoors they should last indefinitely. Heavy weight and two-sided banners with special ropes, hog clips, nylon edging and wind holes are available.